Before we go on to the more complex 3D forms let’s look at one more way to form a figure eight. This Greek Cymbal with Chain, from the Metropolitan Museum of Art, is characteristic of the cymbals that the Greeks used in ecstatic rituals around the 5th-4th century BC. The picture clearly shows the figure eight shaped links. This time they are made by making a loop on each side of the main line of the wire, without any crimping of the central wire, and the ends of the wire are opposite one another on most of the links. And now on to the more complex forms. These chains all start out as figure eights (like the cymbal chain) but then instead of being flat links, half of the link is twisted 90 degrees. I should note that these chains seem to be used starting at least as early as the Greeks and going solidly down into at least the 1500’s in Europe. I have found them all over Europe and the Mediterranean and at least as far east as Persia. I have not studied Far Eastern chains extensively, so I can’t speak for that area. But yet I had never seen any modern jewelry chains that were obviously made this way. It would be interesting to try to figure out when and why they stopped making these chains for jewelry, or whether they are just not represented in Museum collections. Pictures are definitely your friends when talking about these sort of things. So here is a chain, just like the one used on the Greek Cymbal, except half of the link has been turned 90 degrees from the rest of the link. I call this a Twisted Figure Eight, just for convenience. This censor in the collection of the British Museum still retains one of the chains that were originally used to hang it. The ends of the links are rounder than the cymbal chain, but the basic form is the same, until you twist it. This next example is also a Twisted Figure Eight. This chain is part of a Byzantine suspension piece, from the British Museum. I case you are wondering what a suspension piece is, one use for them is to incorporate them into large chandeliers that suspended oil lamps or candles in cathedrals. But back to the chain. What makes this chain look different is the fact that the large chain at the top of the piece is made with square wire. The smaller links on the secondary chains are made with round wire. 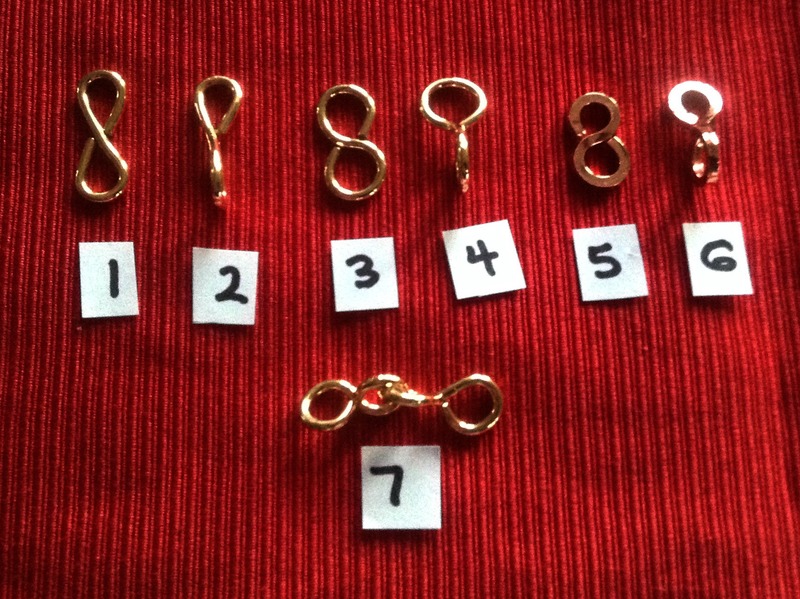 I put together a simple photo of the type of links that I discussed in this blog so that you can see them all at once. Making the links has given me a renewed appreciation for the ancient craftsmen. Number 1 shows the basic cymbal chain link. Number 2 shows the same link twisted. Number 3 shows the rounded link form and 4 shows the twisted version. 5 and 6 are done with square wire to show how much it changes the look. The wire for all of the links is brass, except for the square wire, which is copper. I didn’t have any square brass wire. And 7 shows what a couple of #4’s look like when they are hooked together. Next time: Moving on to the letter B! This entry was posted in Jewelry, Metal Working and tagged ancient chains, figure eight chains, Greek chains, medieval chains, Roman chains, Viking chains, wire chains by Eirny. Bookmark the permalink.